Boil some water with salt in a pan. Add the broccoli florets into this and keep closed for a minute. Switch off and let it rest for about 3 minutes until cooked. Drain and keep aside. In a separate pan, heat 25 gms of butter. Add sliced mushrooms and saute well for few minutes. Then add cooked broccoli. Saute for few minutes and remove from pan. Add remaining 25 gms of butter into the pan, add plain flour and saute until light brown. Add a pinch of salt and then pour in milk and stock. Boil and stir well continuously to avoid lumps. Add the sauteed mushrooms and broccoli and boil for about 2 minutes. Serve hot with pepper powder. so creamy n healthy soup with my fav combo...loved it!! 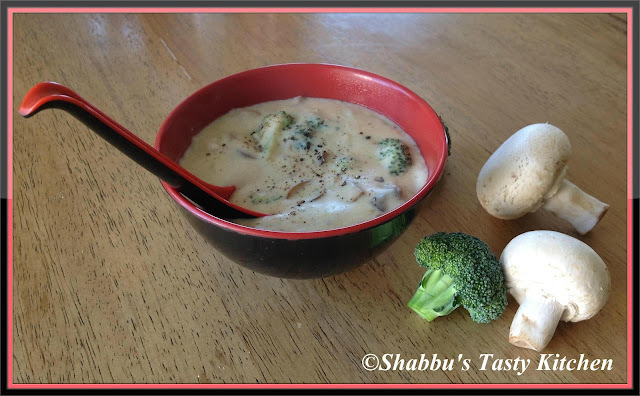 Very healthy creamy and delicious!! Wow, this looks great! I have never actually made soup from scratch before, I must try this soon! wow... soup looks fantastic... delicious! Wow thats a wonderful bowl of super creamy and delicious soup. sooooooo creamy and yummy soap.. thanks for visiting mine.. happy to follow u back..
Soup looks yummy with creamy texture.. This looks super creamy and nice. Absolutely great! The soup looks delicious! Perfect for winters. I am so much bored of having packaged soups.